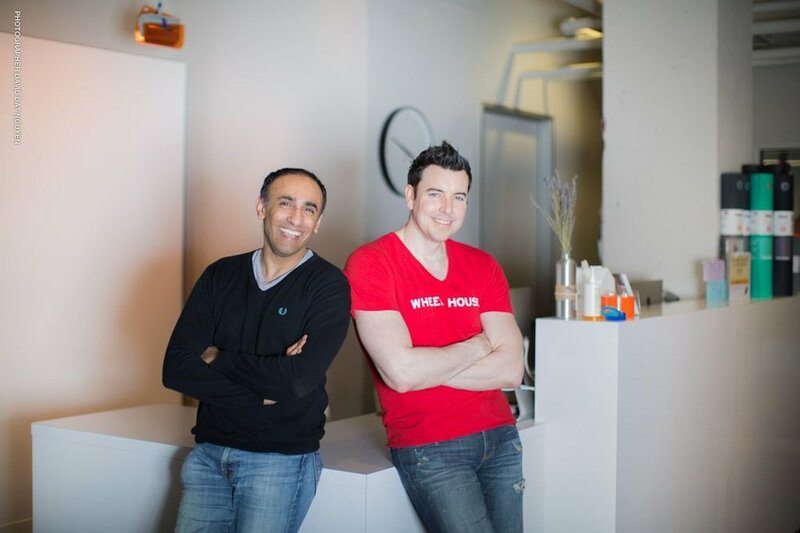 Carl Morley and Suhail Maqsood took a leap of faith familiar to many in the boutique fitness industry, prompted by the sense that there is something more to life than a tech-driven, corporate career. Today, Carl and Suhail run Wheel House, one of our favorite Bay Area studios. Carl and I met about 25 years ago in the UK at Oracle, where we both worked as software engineers. It was a small company back then and, having just graduated, we were both eager to make a difference in the new tech economy. It wasn’t long before we were both transferred to the headquarters in the US to help build the next generation of Oracle’s business applications. Over the next few years, Carl became frustrated with his tech role and felt there was something missing in his life. It was almost as if he had not yet found his calling. It wasn’t until he decided to substitute teach a group fitness class that he realized fitness was his passion. He spent the next year or so studying part-time — getting qualified as a personal trainer and group fitness instructor — and ended up teaching 20+ group fitness classes a week across the Bay Area. All of that, on top of his tech job! Transitioning from a corporate, professional job that you’ve built a career on for 20+ years to starting your own business is no easy task. It required research to find the right location, a vision for the business and the ability to quickly learn how to run a company. But, the magic formula in succeeding really is patience and the ability to sense and adapt to change. Carl believed the big box gyms were neglecting group fitness which was perceived as an overhead. He knew that the group fitness experience could be significantly improved upon if the focus were on people, music and technology. After putting the plans together and overcoming multiple hurdles that seemed impossible at first, Wheel House, a group fitness studio offering 150+ classes per week, finally became a reality and opened its doors on May 28th, 2013. As Carl was researching a location (this can take a while – many months! ), Suhail decided to change his career in honor of his mom who suffered from inoperable inflammatory breast cancer and had always wanted him to find better balance in his demanding and stressful career. He knew that Wheel House was his calling after his mom mentioned one of her regrets in life was not paying attention to her health or finding time to exercise. It’s not been easy starting and running a company, building the brand, identifying and solving business issues as they arise. Unlike the corporate world where you can present solutions to major issues, but someone higher up the food chain gets to make the decision and bear the responsibility, running your own company gives you the power to make decisions — some of which create uncertainty and others of which can affect your ultimate survival. Trust your gut instinct. If a decision feels wrong, then it likely is. Run your options by a trusted friend or family member for advice. Failing that, tap into your local small business organizations — you can find a list of them from the local city offices. Spend like a pauper, save like it’s your last dime. You never know when you’re going to need to dip into reserves to overcome an operational problem such as key equipment failing, etc. Be receptive to feedback and realize the need to change when you see it. Whether it’s good or bad, any feedback from staff, customers or colleagues should be treated as invaluable. Plan for the worst. Do you have an emergency plan in place if a member were to suffer from a heart attack? Or perhaps a water leak from the retail unit above or next door? We’ve experienced both of these events (and more) within the first year of opening. Did we have plans? Not then, but we do now! Build for the future. Make sure you always have a high level or visionary plan for the next year — this will help you and your team stay focused on the present and what you need to do to get to your future vision. Accept the fact: Customers come and go. We’ve delivered 35,000 group fitness classes over the last 5 years in one location! What we’ve learned is that customers will always come and go as life/job changes play a critical part. Make sure you determine the minimum customer threshold number required to cover your costs. This is critical if you are going to survive any slow periods. Wheel House is our passion. We strive to make the studio better each day and with over 130 classes per week, we believe that Wheel House is a fitness studio like no other in San Francisco. We’ve specially designed each room to suit particular types of workouts, paying attention to things like flooring, temperature, lighting, equipment and sound. Wheel House brings together unique technology, second-to-none amenities and environmentally friendly facilities, offering three key fitness focus areas: yoga, core strength, and indoor cycling classes. We believe in removing the obstacles that prevent people from working out and making our classes accessible. Our goal is to reinvent the indoor cycling, core strength and yoga experiences through camaraderie, technology, music and fun! I forgot to add how we stumbled upon zingfit and why we chose it over other fitness studio software options. Two weeks before opening — and having spent over $75,000 on consulting for Mindbody trying to create a site that integrated with MB but displayed our branding — we decided to abandon our website integration with MB completely. Carl found the zingfit site online and John Bogosian demoed the product. Having experienced poor customer support and lack of brand capability on MB we took the risk with zingfit. Two weeks is all it took to develop our site and integrate with zingfit. John’s team made sure it had our own branding and style. We finally had the ability to book a specific spot using any device, seamlessly, from our site — conveying the brand through every step. That was 5 years ago! We opened our doors knowing the boutique studio platform we were using was the best. In our opinion, it still outstrips MINDBODY.